KML supports a feature called a NetworkLink that can chain static KML files together or dynamically generated KML via a "servlet" at the end of a URL. 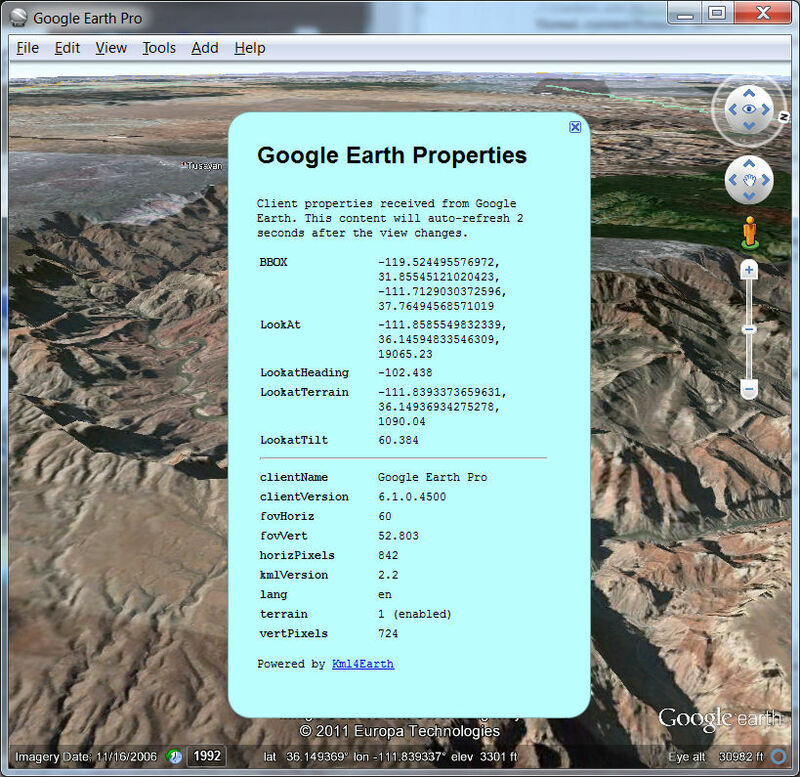 An example KML file with Networklink shows all the available properties from the Google Earth client as described below. 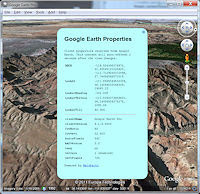 A related KML file uses the BBOX property from which to generate a placemark at the center of the view. Useful tool if you need the exact center latitude/longitude of the current view in Google Earth. The power of the NetworkLink in KML is the ability to receive the client properties from Google Earth which include characteristics of the map view and the Google Earth client itself. Using these properties a backend service could tailor the information to the current view and/or settings of the map. This can greatly reduce data that won't be useful in the target context. Having 3-D terrain enabled could generate a different set of content then if it's disabled as is knowledge of the map screen resolution. No personal information other than these properties can be passed from Google Earth to a backend service through this mechanism. BBOX=[bboxWest],[bboxSouth],[bboxEast],[bboxNorth] - This information matches the Web Map Service (WMS) bounding box specification. This defines the north, east, west, and south-most coordinates of the current view but note that the bounding box is larger than what is actually displayed.